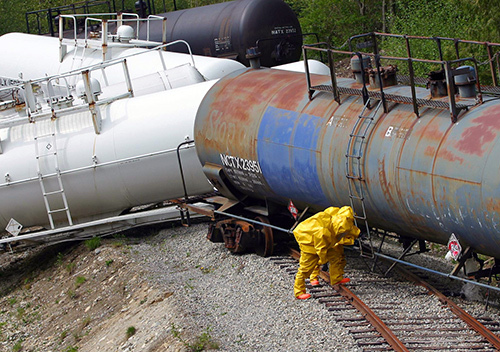 Simulations are at the heart of JIBC’s education and training for public and community safety. 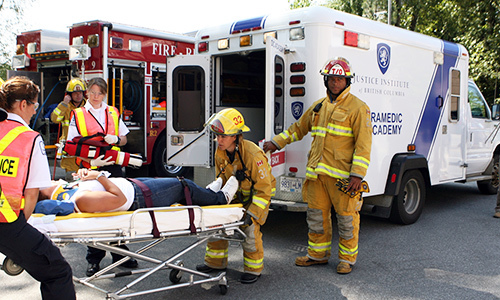 Simulations involve the realistic portrayal of an emergency or crisis situation, allowing students to actively apply new-found knowledge within a safe learning environment. This type of experiential learning is a key component of JIBC's applied learning model. JIBC has been a pioneer in the use of realistic simulations that prepare students for the intensity and complex challenges they will encounter in the field. Simulations enhance the skills of public safety professionals, resulting in safe and secure communities. JIBC uses simulations to provide a safe environment to experiment and gain insight. Educational simulations can involve the use of computers, role-playing, case studies, apparatus, or games. They are designed to imitate or model the behaviour of a situation or system that represents a real-world event, giving simulation participants the opportunity to practice skills in a non-threatening - but realistic - context. 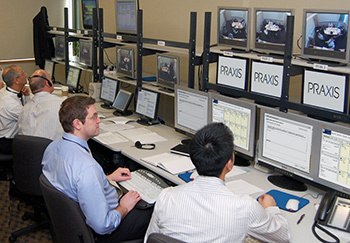 JIBC offers state-of-the-art resources for conducting simulations, including the Dr. Donald B. Rix Public Safety Simulation Building and the award-winning Praxis computer simulation technology. Using these and other resources, JIBC incorporates simulations in programs and courses across the Institute, as well as in customized contract training. 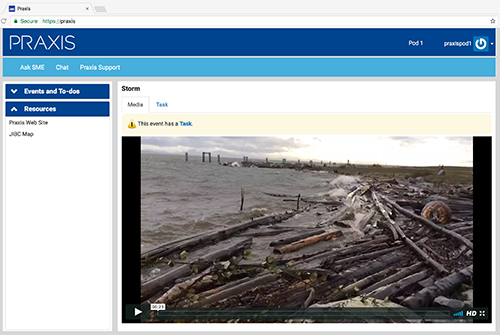 JIBC has worked with government agencies and private industry to produce simulation scenarios of catastrophic events and critical incidents. 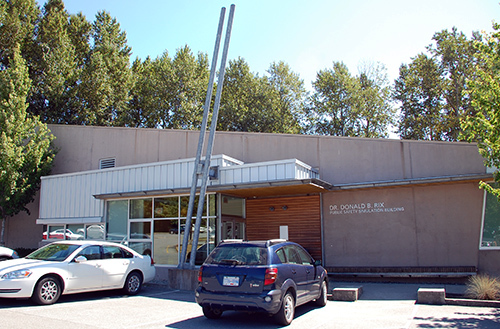 Located at the New Westminster campus, the Dr. Donald B. Rix Public Safety Simulation Building is a purpose-built facility designed for the delivery of immersive, interactive, problem-based experiential computer simulation scenarios. The building includes six specially designed and equipped rooms adjoining a central meeting room with large screens for projection of information, plus a control room that digitally monitors and directs the delivery of simulations. Praxis is an online, team-based learning system that focuses on decision-making simulations. Praxis training simulations provide students with an immersive, interactive first-person perspective of an unfolding scenario or event. Critical thinking is required, as learners apply theories and lessons learned while encountering challenging decision points. Participants gain valuable insight and understanding as they experience the outcomes and consequences of their decisions. The experience and knowledge gained can be transferred to inform better decision making in the future. Read a story on how Praxis was used by Westminster Savings Credit Union in its business continuity planning. Praxis was awarded the "Excellence and Innovation in Overall Use of Technology for Learning and Teaching" in 2011 from the Canadian Network for Innovation in Education. Praxis is designed to deliver interactive, problem-based immersive scenarios. Critical thinking is required, as learners apply policies, procedures, standards and lessons learned while encountering challenging decision points. Individuals gain valuable insight and understanding as they experience the outcomes and consequences of their decisions. Praxis provides an effective way to transfer knowledge, in a low-risk environment, where it is otherwise impractical, dangerous, or expensive to provide learning through real-life, on-the-job experience. The experience and knowledge gained can be transferred to inform better decision making in the future. Participants receive information, complete tasks and make decisions within prescribed timeframes. All activities, decisions, and rationales for decisions are captured and saved to a database for participants and facilitators to review and learn from in a safe, consequence free environment. Because it’s a web-based, Praxis training can be delivered at any location there is high-speed Internet on standard computers. Simulated training is one of the most cost and time effective methodologies for knowledge and skills acquisition. Simulations enable discovery, experimentation, role modelling, and practice in a low-risk environment that may otherwise be too dangerous or expensive to acquire through real-life experience. Praxis simulations provide an opportunity to practice for even the most unforeseen contingency, emerging as an effective way to train personnel at all the levels of responsibility, and to both develop and assess new tactics, techniques or procedures, and evaluate efficiency. For more information about Praxis, visit the Praxis website at www.praxissim.com or contact Bob Walker at rwalker@jibc.ca. Exercising is a critical component of every emergency management and business continuity plan and the best way to apply learning and identify important resource gaps. JIBC’s Emergency Management Division offers Exercise Design training and services. Learn how to deliver seminars, workshops, table-tops, immersive simulations, drills, functional exercises, or full-scale exercises. Have an exercise developed and delivered using JIBC’s Praxis: Computer Assisted Simulation system. For more information about Exercise Design training and services, contact Darren Blackburn at dblackburn@jibc.ca. JIBC’s Fire & Safety Division conducts extensive simulations at the Institute’s Maple Ridge campus. The campus is equipped with a burn building, ship mockup, hazmat warehouse, and other resources to prepare students for situations they may face when responding to incidents with fire departments. In the burn building, students working in teams use attack lines, ladders, personal protective equipment, and other tools to attack interior structure fires. Along with instruction from Training Officers, students using the burn building have the opportunity to practice correct water application and suppression practices for bringing fires under control. The ship mockup is used to train people entering the marine industry in techniques needed to fight fires aboard ships. Using the ship stand pipe system, students enter a vessel replica that has various compartments found aboard a ship and practice shipboard fire fighting techniques. In the hazmat warehouse, technicians spill colored liquid or a powder-type product to simulate potentially hazardous material. Students enter the building wearing protective equipment to investigate and/or remediate the situation. For more information about simulations in the Fire & Safety Division, contact Charlene Jordan-Jones at cjordan-jones@jibc.ca. The School of Health, Community & Social Justice maximizes the use of simulations to help learners develop competency in leadership, conflict resolution, and counselling for dynamic and complex situations. Through case and problem-based activities, role-play scenarios, and technology-enabled simulation, our learners are immersed in real-world situations relevant to their professional practice. Learners in the School’s Centre for Leadership, for example, participate in a unique computer-based leadership simulation to apply core leadership skills to a real-time workplace scenario. This immersive learning experience hones skills in decision-making, teamwork, human resource management, and crisis leadership, and can be immediately applied in the workplace. In courses specifically designed for counsellors, therapists, and front-line workers in a variety of agencies, Centre for Counselling & Community Safety learners practice what they learn in the classroom by role-playing counselling techniques. This provides them with the opportunity to experience exactly how the latest evidence-based skills used in contemporary counselling practice today can be implemented. In courses for community safety professionals, such as bylaw officers, a variety of simulation methods are used to reflect the situations they will encounter in their daily work setting. In the Centre for Conflict Resolution, simulation in conflict resolution programs and courses is primarily based on role-playing engagement in conflict scenarios. Learners participate in scenario-based conflict situations to practice their skills, approaches, and processes in small facilitated groups. They receive individualized feedback from professional feedback coaches who help learners reflect on their experience both during and after the simulation. Coaches also provide feedback on learners’ areas of strength and areas for improvement. Health Sciences has a rich history in the use of simulation-based education and training. From segmented calls, to the use of high-fidelity mannequins, to full interprofessional and interdisciplinary exercises, the School embraces simulation learning. Segmented calls: the use of a portion of a response to focus on a specific skill set. Role-play: use of actors to practice assessment and treatment. Full calls: dispatch, assessment, treatment, and transportation of a patient to a care facility. High fidelity simulations: the use of mannequins for the purpose of low-incidence, high-risk scenarios. Full-scale exercises: conducting simulations in conjunction with other health professionals and public safety sector organizations to enrich wide-scale incident training. In their feedback, students give high ratings to our simulation-based education and training due to the quality of the learning and the expertise of our faculty. For more information about simulations in Health Sciences, contact Kathy Harms at kharms@jibc.ca. For more information about simulations in the School of Community & Social Justice, contact Barb Kidd at bkidd@jibc.ca.